The drought has continued throughout August and the bush is very dry. Game viewing has been excellent throughout the month and there have been numerous occasions when our guides have had sightings of all Big Five before lunch-time. It has been an amazing month for lion sightings : we went into Kruger Park every single day in August ( 31 entries ) and had lion sightings EVERY day ! I see most of the guides have chosen lion photos to include with their reports. The shortage of water has resulted in large concentrations of animals both at Tremisana Lodge where we fill Tremisana Dam with borehole water and at Marcs Treehouse Lodge along the Klaserie River. There have been some unusual consequences : At Tremisana we have had regular visits from all the big cats – our Camera Trap has taken images of lions, leopards and cheetah. 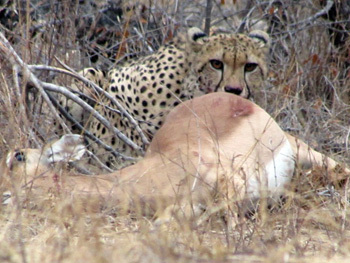 In fact a young female cheetah has established her territory around Tremisana Dam and just last week pulled down an impala ewe right at the dam. 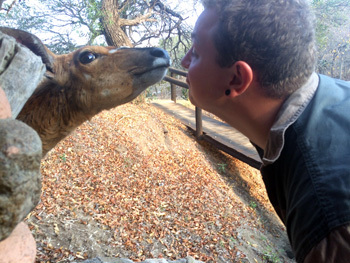 At Marcs Treehouse Lodge, the nyala have become so tame that they can be approached extremely closely. Some of our staff have felt really sorry for them and have been feeding them leaves taken from high up in the trees where the nyala cannot reach. I am not over enthusiastic about this practice but I do understand how emotional it can get be when the animals are suffering as they are. Charl, our intern, gets really close to nay ewe. The elephants at Tremisana have also done their thing : many trees have been damaged and often our guests are delayed because of the elephants in the car park. On the 02-08-15, on our drive to where we conduct the bushwalk we found a leopard waiting for a warthog to leave its hole. It was peaceful and everyone was waiting to see some action. We waited for almost twenty minutes until just before sunrise but nothing happened. On the bushwalk we come across a mother and baby black rhino browsing. The baby was very active : running around and looking at us for a long time. Behind us there were two giraffe. After a few minutes we heard breaking of branches and we knew that elephants were moving through the bush. We tried to approach them but it was not easy, because of the wind direction changing all the time. The elephants moved towards Olifants River to drink water and we followed them. It was awesome to be so close to such big and dangerous animals. On the other side of the river the baboons were giving their alarm bark – we suspected they had spotted lions or leopards in the area. Everyone was hoping to see some action – perhaps a leopard attacking baboons so we went to the area to check but we didn’t see anything. We then heard lions roaring very close to us but we did not see them. On the return drive near Tremisana Lodge we spotted three big bull elephants feeding right next to the front gate. We had to wait until they moved away. It was a sunny day on 11 August 2015 and everyone was excited about visiting the Kruger National Park. A few kilometres from Orpen gate we had a good sighting of a big herd of elephants feeding along the road moving slowly towards Orpen Camp to drink water. One of my guests was looking at a bird on top of a tree, as it was calling beautifully and he found a leopard sleeping on top of the tree ! Later we found two white rhinos drinking water at the Timbavati River. After that they started moving towards the road. They come very close to us and we enjoyed watching them so close. We found all big five in one day! The adventure has just begun for my new group of guests, all of whom have just arrived from Johannesburg. Its Sunset Drive time in Balule and expectations are high. What will we see…? 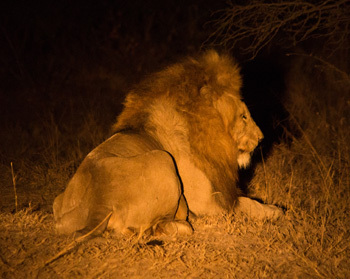 The previous night a pride of ten lions had taken down an adult female giraffe – that’s where we were heading. The lions would have to wait however as it was elephant time – I had received information on the radio that a bachelor herd was in the area. We zoomed off in the direction of the elephants – we could hear them long before we could see them. Elephants have a bad reputation for pushing over large mature trees, changing the landscape into Savannah grassland. It was the sound of branches crashing that alerted us to the whereabouts of the herd. At first we only saw one, then two and eventually we sat watching a herd of ten big bulls. The vehicle was dwarfed by their huge size, really making us feel small. Through the trees to the west we watched the sun setting in the sky, a big ball of orange sinking behind the Drakensberg Mountains. We pushed our way through the herd, giving the big bulls the right of way when necessary. Their trunks raised in the air, smelling us as we went past. The delaying detours continued – this time I received a radio report of a leopard sighting, not far from where we had seen the elephants. Off we went. The sight of another vehicle gave away the leopards position, we eased our way in and there he was. A beautiful big male leopard, which was breathing heavily, not far from the vehicle. The scars on his face, suggested he had been in a recent fight. We could still hear the elephants, crashing through the trees in the background. All our senses were at work, taking in the magic of the moment. Now back to those lions – off we went still amazed at how lucky we had been so far. The light began to fade – it was time for the spotlight. The trees are home to a little creature called a bush baby, incredible little jumpers. When we finally spotted one, my guests loved how big its eyes were, and the fact that it leaped from tree to tree, showing off its athletic abilities. We drew closer to where the lions had made the kill; a strong smell of rotting meat was in the air, but no sign of lions as yet. 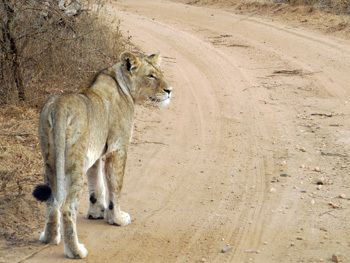 The luck continued to flow, we timed our arrival just as the pride of lions decided to cross the road in front of us. They then moved straight for the kill, ripping off bits of meat and pushing each other around, testing their strength. The big male decided he had had enough and lay flat on his side, in the open giving us a great view. We all enjoyed the sighting and started to head for dinner, and, with three of the big five under the belt, we had done very well. The bush however had even greater plans. It was a big grey shape moving away from us, stomping through the bush, its horn visible from our angle. It was a white rhino on a mission, not interested in sticking around for long, but a nice way to go into dinner. We arrived at Marula Boma, dinner by candle light in the middle of the bush, under the star filled sky. What a great start to an animal packed safari – my guests will never forget their first Sunset Drive with Viva Safaris! While on the bushwalk we had come across lions on a kudu kill. Along the way back we came across another lion sighting, this time it was two lionesses on an impala kill. There were 4 bull elephants that decided to chase the lioness from the kill. While on the drive we came across 6 bull elephants near Campfire. We carried on with the walk and came across another bull elephant. Along the Olifants river, we enjoyed a rare sighting of hippos and crocodiles out of the water. On the drive back we had good general game sightings. As we reached Nonwane Dam, on the northern side we saw a pride of lions. What a bush walk ! We came across many elephants and buffalo along the Olifants road. We also saw a big pride of lions just west of Shikumba Dam. We have been very fortunate with these sightings of the big cats this month! There were also 6 elephant bulls on Olifants road. Each evening at the Marula Boma we have been hearing the hyena calling. On some occasions we have actually saw them nearby. What an action – packed day !!! On the drive to our walking area, we started off with a sighting of 7 bull elephants along the Sable/Olifants intersection. When we moved to Nonwane/ Impalabos cutline we came across a pride of lions. The magnificent big male, 3 females and 6 cubs were on a giraffe kill. Along the walk we had seen a large herd of elephants. On Rome 1 we came across giraffe, zebra, impala and kudu. While driving we found 8 bull elephants near Campfire. When we approached Nonwane we found more lions but on a kudu kill this time. Along Olifants road we came across more elephants At Rome 2 we came across a magnificent bull rhino. While on the walk we came across hippos out of the water, about 20m away. We also saw elephants north of the river. There were 4 bull elephants on Barnards Airstrip. We also came across a massive herd of buffalo near Pondoro. My guests were thrilled ! The month of August has been really amazing, continuing from last month where we had quite a number of leopard sightings. This month we had many sightings of cheetah. The first lovely sighting of cheetah was near Nsemani dam which is already out of water. Two cheetah were relaxing under the shade of a tree. They got up and started to stalk some zebras coming towards them – there some young zebras in that dazzle and that is what caused the cheetah to pay attention. Unfortunately they were spotted from a long way off and the zebras ran away. On our way out near to Orpen gate another cheetah was lying next to the road. Lions and leopard have been easy targets for us along the S39 Timbavati river road. We found a mating pair of lions in the river next to Timbavati picnic spot. We then found a male leopard stalking some impalas next to the river. As we approached the sighting, the impalas spotted the leopard and ran away. The leopard decided to climb a tree right next to our open vehicle ! Later on we found two hyenas sleeping next to the road. Nsemani dam is now completely dry but that doesn’t stop attracting game : in the open area we found two lioness and a lion. On the other side of the dam there were hippos, crocodiles, buffaloes and giraffe still looking for water. 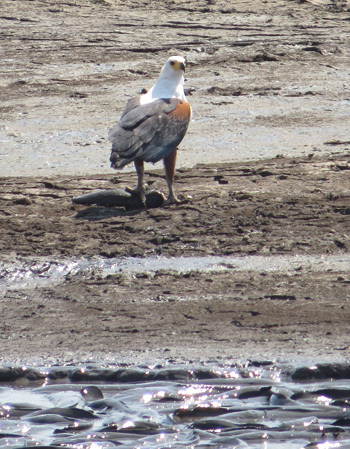 The marabou storks and the fish eagles were both collecting the catfish which were stuck in the mud. A few days later when I drove back to Nsemani dam the baby hippo that used to play with impala had been killed by lions and the mother hippo had left. A pride of lions killed a fully grown giraffe next to Satara just two metres away from the main road. The rest of the pride had just left to drink water as we drove in but we managed to spend quality time with the two big males that were guarding the carcass. They had to sleep next to the carcass but still that did not stop the vultures from landing and have a quick nibble. This was so good for us because the lions had to wake up and chase the vultures and run towards our vehicle. Our guests were really very excited to see the big cat next to the open vehicle. We completed a brilliant day with a sighting of two rhinos sleeping next to a water hole. On the 2nd August we had brilliant sightings: five out of five. Highlights were lions on the Timbavati riverbed lying on the sand and a leopard busy eating an impala. On the 4th of August, we again achieved 5 out of 5. There were 4 lions at Nsemani dam again trying to take down giraffes and impala but they unfortunately failed. There was a Leopard approximately 8kms from Orpen main road towards Timbavati picnic in a beautiful Fig tree overhanging a pool. The leopard was very chilled and just relaxing. The guests were very happy. On the 5th August once again I went to Kruger for a full day and we managed to get 4 out of 5 plus a cheetah! We saw this cheetah on S100 crossing the road in front of us and not too far ahead on the same road were 4 lions with 3 cubs eating a giraffe. On the 11th we saw 4 out of 5 except the rhino. The leopard was at Nsemani dam view point with an impala carcass hanging in the tree. The lions we found on S100 again. Then to our surprise we saw another leopard up in a tree on the S127 road. This one was a very good spot, was quite difficult to see but the guests had a fantastic experience. On the 12th we had yet another good day. At Satara gate there were 4 male lions that had killed a buffalo. This was a fascinating sighting. We then saw a leopard at the same spot as the previous day on S127 still hanging in its tree. On the 13th we had a fantastic day with 5 out of 5. 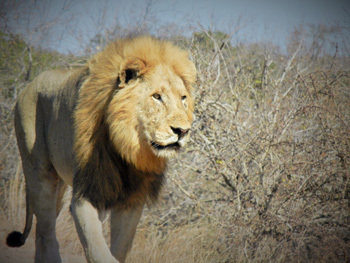 The lions were again at Nsemani and the Rhinos were just off the main Satara road towards Olifants. The leopard was spotted again at S127 in the same tree for 3 days in a row. This is a very lazy leopard or digesting a very big meal. We saw a second leopard on the Timbavati road near Ratelpan in a Leadwood tree. Rhinos were seen near Girivana. On the 21st we sighted 4 out of 5. We spotted 4 male lions near Nsemani dam then we found 3 cheetahs at Timbavati and then we went back to Nsemani dam where the lions had killed a baby hippo. This was a very sad day for me as we have been watching this baby grow for many months now. On the 23rd we spotted 5 out of 5 including 2 cheetahs. The cheetahs were found lying down on the S40. A male lion was found on the road just off the Girivana T junction, and then on the way out of the park we found a leopard at the first view point on Orpen road. We took the Rabolais road home and we found 2 lions lying down under a tree and then a rhino crossed the road near our vehicle. On the 26th we got 5 rhinos on S40 lying down and a cheetah N’wanetsi road. 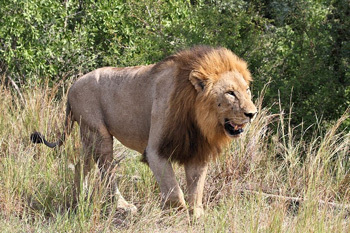 We also found 3 male lions that had killed a giraffe and were feasting on its carcass. On the 27th we found the lions again on the same giraffe carcass as the day before. The rhinos were located at vulture pan and the leopard was in a tree with its impala carcass. After the leopard we ventured down Sweni road heading home and at the water tank we were lucky enough to be accompanied by a spotted hyena. We were very fortunate to see this animal. It was a very good day. This was one of the best months of my guiding career ! This month I’ve had a few good and exciting sightings. On one of the drives in Balule, we got a great sighting of a bachelor herd of elephant bulls and 2 of them had some of the biggest tusks I’ve ever seen! They were very relaxed and the one came really nice and close to the vehicle, giving us breathtakingly amazing emotions. Another sighting was a brief sighting on the way to the Marula Boma, a VERY scarcely seen aardvark, next to the road! Then a big hyena crossed the road right in front of us. Later, on the way back, we had an amazing sighting of 2 white rhinos grazing next to the road. We couldn’t shine the spotlight on them for too long because, being diurnal animals and having bad eyesight, they can easily be momentarily blinded. On another game drive we saw a really magnificent pride of lions that had made a giraffe kill. We had a fantastic view of the females and cubs, once the other vehicles had all left and then suddenly the male lion popped up out of nowhere and we got to see him nice and close up. 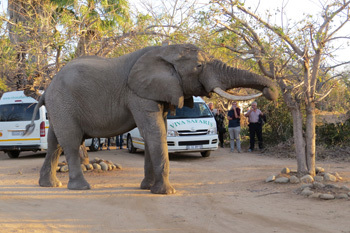 While driving on a sunset drive down Marula road, we got a big herd of bull elephants. Suddenly, a huge male leopard, full of scars and licking himself while he lay on a termite mound caught our eyes……. and wow!!! How close he was to the car and not bothered at all by us or our vehicle. A rare and well appreciated sighting indeed!! I had quite a few very good sightings in Kruger National Park this month. On one occasion, as we were entering Orpen gate, there lying on the side of the road, was a beautiful male cheetah. On another occasion we got another magnificent sighting of a cheetah, not too far from Satara, in the hot midday sun. She was eyeing a nearby herd of zebra when suddenly she got up and started stalking something in the bush. Tension in the air… waiting silently for something to happen… she sat back down and had obviously decided that the stalk wasn’t worth the chance. On another occasion, we got a really fantastic sighting of a gorgeous young male leopard hanging typically in an Apple leaf tree along the Timbavati River. We got beautiful pictures of him posing until he decided to climb down the tree. For the few weeks that I have worked for Viva Safaris, I have had some of the most amazing experiences and sightings of my life! I have learnt a huge amount of information about this area. I can’t wait to see what next month brings! Luckily we have been blessed a few times this month with some excellent elephant sightings. One morning we had a special sighting of lions!!!!! And if that wasn’t enough …we found leopard!! While on the bushwalks we always come across beautiful sightings of Elephants. As we show our guests around the river, looking for tracks, we have been very fortunate with rare sightings of Hippo out of the water. They usually come out of the water in the late evenings and early mornings in order to graze. One of the special benefits of working in Balule Game Reserve is that there is a good population of Black rhino. While on our bushwalks we often find black rhino. The pure thought that we are in the area of black rhino, let alone seeing one, is for me both scary and fascinating! We have seen the lions quite a few times this month ! We were treated twice with an excellent view of lions on a kill. The first kill was a giraffe and the second kill was a kudu. It was amazing to see something like that in the heat of the day. To top it off we got to see some pretty nice sightings of leopard!!!! Walking right next to the road!!! As the evenings start to get warmer, we have been seeing a few more animals moving around at night. We have had many Elephant sightings across the reserve. I was lucky enough to find a Honey Badger, which is one of the rarest sightings even for a professional guide that has worked in the same area for many years. We have also been graced with the presence of the local pride of Lions. The Leopard sightings have been by far my favourite part of my drives. Some of the guests have said that I’m the good luck charm as I seem to be finding leopards quite often. We have also been seeing a large herd of Buffalo. While on the drive my guests were fortunate in seeing the white Rhino. The Hyena has become a regular visitor to the Marula Boma while the guests are eating their bush barbeque dinner. We can hear them calling nearby and on certain occasions my guests have been lucky to see them. Civets and Genets seem to be coming out more often this month. Not only have we had a few visits the lodge but I have also had some sightings of them on my sunset drives. All in all this month has been excellent with sightings of the big 5 often occurring. My absolute favourite sighting has definitely been the cats. It’s very rare to see some of these cats, so being privileged enough to see them more than once is special. Now just to wait until the rains come! With the shortage of water, we have had excellent sightings at both lodges. This month at Marc’s Camp we can really feel the warmer weather on its way – Spring is here. The cooler evenings make for an enjoyable night around the campfire. The guests often treat themselves to a beverage or two after their long day of safari adventures and sit around the fire to warm themselves up whilst meeting new faces and sharing their travel stories and sightings of the day. As it gets warmer, the little critters start to come back as well. We are starting to hear that little buzzing noise coming from the mosquitos and the crickets & frogs are starting to croak. For our team at Marc’s Camp this means summer preparation has commenced. We have started preparing rooms ensuring all mosquito nets are up to scratch and ready to keep the mozzies away. The bush itself is still very dry. To the untrained eye this can appear quite unappealing compared to the lush greenery we see in the summertime. For the trained eye, this time of year is quite fascinating. The Leopard Orchids we have growing around the camp are in bloom. Once this is pointed out to our guests, they see nothing but beautiful yellow orchid flowers growing on their balconies of their treehouses and amongst their host trees. The Klaserie River is quite low but is still flowing. Most of the rooms overlook the river and guests are pleasantly surprised by the amount of general game that comes for a drink. On our walks along the river, our guests can bump into giraffes to get a nice “selfie” and viewing a vast array of general game such as Kudu, Waterbuck, Nyala, Zebra, Wildebeest etc. whilst watching a beautiful African morning sunrise. Tremisana Lodge has been buzzing a lot lately, and I don’t just mean the mosquitos. We have had many international guests gracing our bush this month. We have loved hearing the guests’ views of our magnificent country, as well as watching them learn each day about our fauna and flora. As you have read, South Africa is going through a major drought which is caused by a weather phenomenon known as EL NINO. This is expected to last until the beginning of 2016. The Wardens have been monitoring this situation very carefully. The fact that we are open to Kruger National Park means that our animals can move far distances when looking for water sources and decent vegetation to consume. A troop of baboons have arrived at Tremisana lodge which is famous for our vervet monkeys. But due to the major drought we have had some new patrons visiting lately! Lately a baboon troop has come closer, usually during mid morning breakfast, and the vervet monkeys seem to disappear into the rest of the reserve. 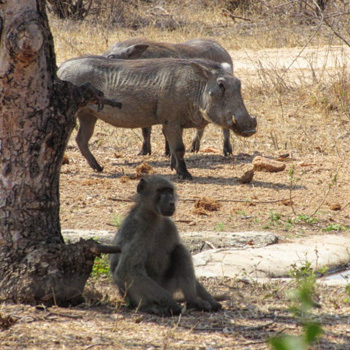 Our waterhole has become an oasis for these baboons, as well as many other smaller animals such as banded mongoose, varieties of birdlife, warthogs and even our little duikers and steenboks. We’ve generally had very successful sightings of giraffe and elephant frequently visiting our waterhole and spending lengths of time with us. Lately I have been blessed with an outside partner for assistance at my office. Each afternoon when the lodge is quiet I have a vervet monkey that decides to check up on me and spend time with me outside my office window. Our vervet monkeys are on their way to becoming professional guides as I have seen them practising sitting in our game viewing vehicles in a familiar guiding style. And luckily they know the area very well! While it has been quiet around the lodge in the late afternoon and early evening I have also seen many tree squirrels from my office window. Our waterhole has had lots of action lately, especially in the evenings! Our recently installed trap camera has picked up some fascinating sightings. We have had Bushpigs, Hyena, Jackals, Civets, Buffalo, Baboons and all big 5 ! We have also had a rare sightings of a Honey badger! But our most special and fascinating sightings have been the cats. We have had a cheetah visit and recently we have had a female and male leopard. We have been monitoring the times these cats have been around our lodge. As seen with our trap camera at our waterhole, we have been monitoring a female leopards movements just outside of our lodge boundaries. She has become a regular around our area in the later evenings. We have also picked up the movement of a male leopard in the area. We assume that they may have started mating in this area. Occasionally, if you can handle staying awake a little later, we have heard them calling and the vervet monkeys going crazy. Usually this is a clear indication of leopards or other big cats in the area. 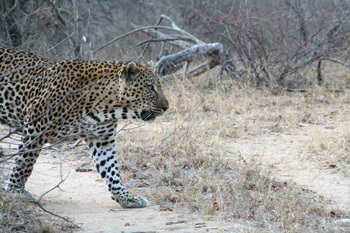 We are hoping that we may get our very first sighting of a leopard cub in the upcoming months. As many of our guests have discovered, we have a full blown frog symphony at our lodge ponds each night. Although many have found them irritating, especially the ‘locals’, our guests have been fascinated by the pure power of their vocal cords. We have had many nights whereby our guests have surrounded the ponds near the bar area, learning about these frogs. This adds to the real atmosphere of the bush. August has seen an improvement in visitors and I have enjoyed talking to the many Italian visitors. We hope that the trend continues! What an incredible experience! I highly recommend Viva Safaris as an affordable option. I stayed in their quaint Tremisana lodge where they served home cooked meals and provided a variety of game viewing drives and walks. Plus, it’s like Cheers where everyone knows your name. I believe the lodge is considered three star, but don’t let that scare you away. It’s more than perfect for what you need while on safari. As a solo traveler, it was a great choice. I felt more than safe and was even with other solo travelers most of the time. I was able to arrange my flight so that I arrived to Johannesburg just an hour before Viva arrived and was taken back to the airport in time for my flight home. This was a great arrangement for me as a solo traveler having been warned about my safety in Johannesburg. My only complaint is that the wifi is iffy at best. If you need to have Internet access, bring a phone that can serve as a hot spot. Vodacom has great coverage at Tremisana and many areas on the drives. Our lodging bungalow was very comfortable but what made this such an outstanding experience were the wonderful guides. We had tremendous luck seeing lions, rhinoceros, elephants, giraffe, zebra, cape buffalo, impala, kudu and more in our first 24 hours! Our guides were just as excited as we were and so very knowledgable. This is an up close and personal bush game viewing experience. Very different from Kruger which offers more expansive views. Both are equally wonderful. Viva Safaris put together a wonderful trip for us for a very affordable price. Kudos to the staff at Marc’s Treehouse Camp! We’re a couple in our mid-seventies, and had a super time at this safari camp. We recommend it to anyone of whatever age. We stayed in one of the tent cabins in early August ’15. The tent was cosy, with a comfy bed and plenty of warm blankets (this was winter, after all). The hike to the tent from the Lodge was made easy by the willing staff members who carried our luggage. The treehouses are now down at lower levels, due to a flood last year, but the experience of staying among the tree is the same. Night viewings of a herd of Nyala browsing through the campsite added to our experience of camping in the Bush. Food at the Lodge was excellent, with a cooked breakfast and a barbecue dinner around a roaring fire. The next day’s activities were explained clearly to the group after dinner. Excellent wine and beer are available for dinner. The bar tab needs to be settled with cash, not credit cards. Many thanks to Jeanette and the wonderful staff for their care and commitment to our comfort and our experience of life on safari. I will keep it short as many reviews have already been placed for this tremendous spot in a private game reserve close to the Kruger National Park. The staff is very friendly and attentive. The guides who take you out for bush walks and game drives are very close to the nature and can answer every question you have related to the animal world and the environment. They introduce the nature and animals cautiosly which means you most probably will not see the big five at your first bush walk or game drive. One who is patient and optimistic will get to see everything by its time. The accommodation is very basic, but well constructed made of wood in the bushes. One must keep in mind that Marcs Treehouse is in the middle of nowhere and considering this fact it is outstanding. Keep in mind that the Treehouses are in the African wildlife which means little insects might share a room with you. All in all it was a wonderful stay, we met very kind travelling companions, the tours were very well organized and the whole team awesome. Right on.